Alright guys, I finally have my kid’s gift guide ready to roll! And I only managed to overlap one item from last year’s guide (which is still relevant if you want to check it out! ), but a bean bag is pretty classic after all, right? Sometimes I struggle pulling these together even with three little ones of my own, but this came together pretty seamlessly. I’m hoping it can serve as some good inspiration for you and any little ones you may have one your list this year! 1.) Suspend game: This was a new find for me, but it has a crazy amount of great reviews and it looks like a game that’s perfect (and FUN) for all ages, which is tricky to tackle with the range of kids in our house! 2.) Ice Cream Counter: My girls would love this ice cream stand! If only their lists weren’t already a mile long! So stinkin’ cute. 3.) Cuddle + Kind Bear: Okay, I lied. I also had another Cuddle+Kind animal on last years gift guide. My bad. But as an update, my girls have had theirs for a year now and my 2 year old sleeps with hers every night and my 5 year old keeps hers on her bed when it’s made. They play with them all the time as the ‘mommy’ and the ‘baby’ which is adorable. And just to top it off, each doll purchased feeds 10 meals to children in need. Pretty cool! 5.) Singing Machine: Anyone else have children that love to sing? I’m really hoping to get this for the girls as I can see it providing hours of entertainment for us all! 8.) Sleeping Bag: Another classic gift, but boy do they have some adorable options! 9.) Drone Car: My son desperately wants a drone but I have no intention of paying an arm and a leg for one. I came across this option, a flying car, that I’m thinking he’d be pretty happy with. 10.) Drum Set: This was one of the best gifts given to my son when he turned one and we have since gifted it a number of times to others. It may be loud, but it keeps them busy! 11.) Baby Stella: A perfect first baby doll for little ones. The magnetic pacifier is a huge hit! 12.) Puppet Theater: For all your rising theater stars, or for a little family fun. This theater can be set up anywhere in the home for great entertainment! Happy Cyber Monday, guys! The sales haven’t really stopped since Friday, but I am keeping this post up to date with my favorites, so be sure to check it out! 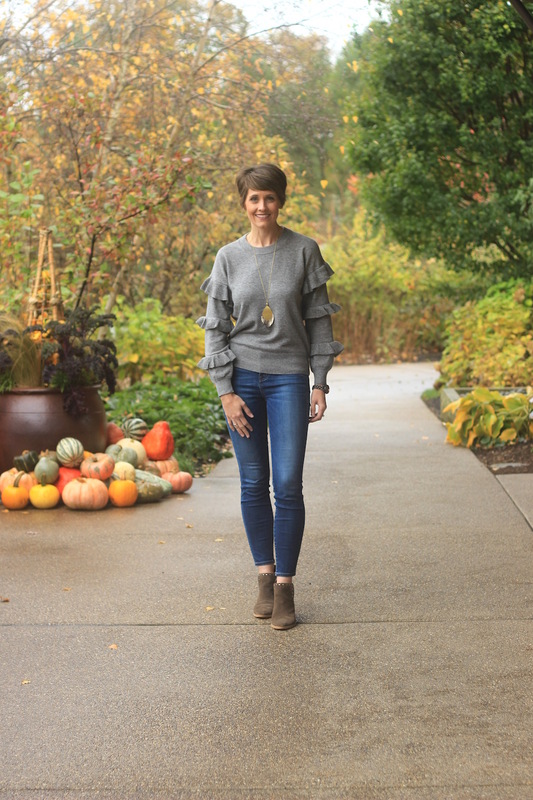 This adorable, embellished sweatshirt is a part of one of the sale’s going on now and I plan on wearing it all throughout the winter. I love a relaxed outfit with a bit of flare! I’ve also been throwing on a faux fur stole over my outfits lately and love the result. It adds an extra touch without much effort at all. I’ve been tossing them on not only over my jackets, but also over my cardigans as well to add a fun touch. I own a couple of them but would love to add this cabernet color to my closet as well to make a little bolder of a statement. I hope you are all recovered from a wonderful Thanksgiving. I’m getting there, but there was so much good food! We started off our day watching the Thanksgiving Day parade before heading to my in-laws for the rest of the day. I love holidays for many reasons but I especially enjoy the slow, lazy mornings that allow us the extra time to take it easy and snuggle a little longer with our babes. I was even able to finish my entire cup of coffee which is no small victory! Ever since I bought these sneakers, I’ve been lured more frequently to the athleisure side. With the cold weather settling in, it just gives me more of an excuse to cozy up. That, in addition to the busy schedules that we’re about to endure over the next few weeks means you’ll likely be seeing me dressed this way more often than not! I couldn’t pass up this adorable top. 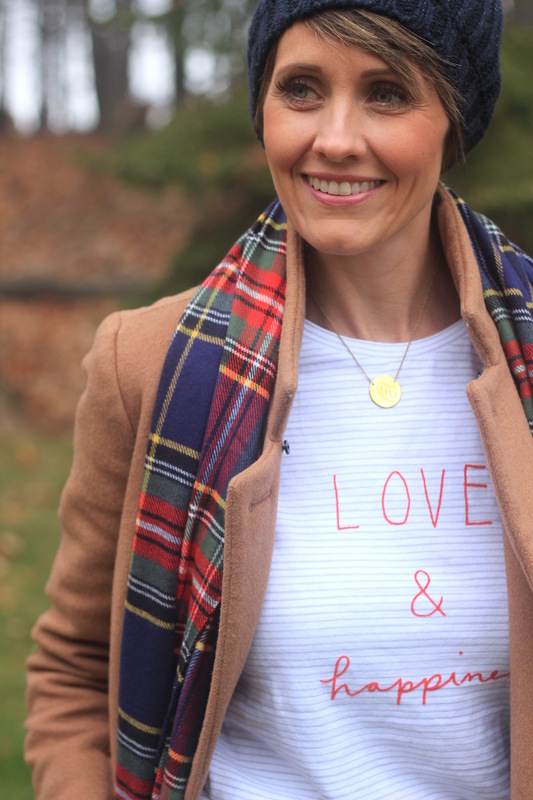 It’s perfect for layering under cardigans this winter and it wouldn’t make a bad Christmas gift either! Speaking of gifts, I’ll be updating my previous post with some of my favorite sales happening now through Monday. Let me know what deals you’re scoring! Black Friday hasn’t even hit and yet many retailers are already rolling out their sales! In all honesty, I’m not sure how much better of a deal Black Friday and Cyber Monday are going to offer. To me it seems as though we are already on the sale roller coaster that will take us straight through to Christmas, and I’ll take it! I’ve starting gathering the sales that have already caught my eye and I’ll continue to update through Monday, so be sure to check back! I hope you all had a wonderful weekend and are gearing up for the week ahead and all the hustle, bustle and traveling that’s involved! We got the bulk of our Christmas decorating out of the way over the weekend so I wouldn’t feel rushed immediately following Thanksgiving. And since we aren’t hosting this year, I figured it wouldn’t hurt to have it done. We still have our family tree to go pick out and the exterior to tackle, so that should keep us busy enough! In the meantime I’m retraining my toddler that the Christmas decor is not her new playland, oy!! I wore this outfit to church on Sunday and just loved it. The dress is very comfortable and adding a sweater vest for warmth was just what I needed. You could pair this with leggings as well, but I opted for some over-the-knee boots. Mixing and matching pieces is what wardrobes thrive on, so have fun with it! 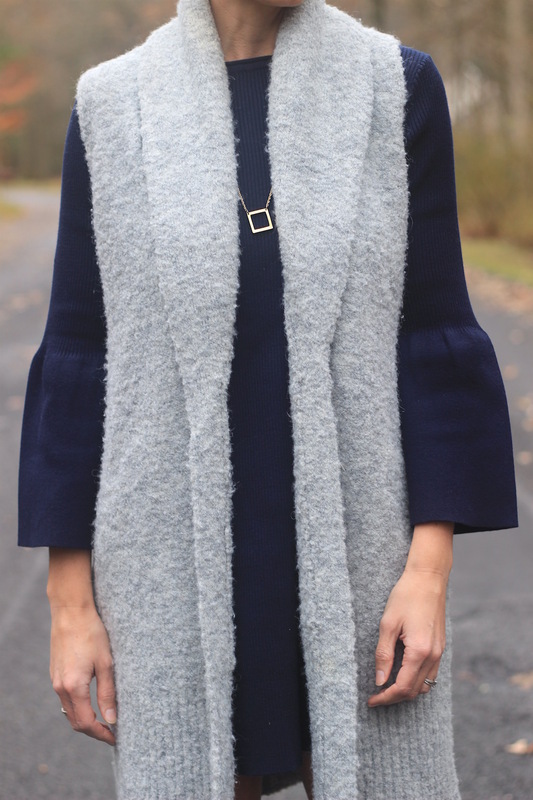 A good faux fur vest would also look darling, as would a warm blanket scarf. There’s so much potential! Anyone start decorating yet? It’s ok if you have, I won’t judge. I’ve honestly wanted to start but haven’t had the time yet. Although I did make my front door wreath which you may have caught a glimpse of on my Insta-stories. After making this one and realizing just how simple it is, I decided to make another and get exactly what I wanted. I still recommend trying your hand at it if you have any interest! When it comes to decorating my home, I’m never very set in my ways. This will be our third Christmas in this house and each year I change things up. When I’m shopping, I enjoy finding pieces that I love, which isn’t to say they are exactly what I need. I find that when I unpack my holiday boxes and they are all filled with pieces that speak to me (so to speak), I’m able to play around and rearrange as I see fit. Once I have everything decorated, then I can fill in the gaps by picking up a few odds and ends to finish things up. Take a look at some of my favorite pieces out this year and hopefully they can provide some inspiration for your own home! I know there are some of you that have Christmas shopping well underway, others that have yet to think about it and then the rest that may fall into my boat; lists being drafted and a few gifts stashed away. I’ll have a handful of gift guides coming out over the next few weeks to serve as inspiration for those that may need it. I felt that I would start off with the Hostess Gift Guide as parties are likely starting to pile up. I’m guessing your hosts aren’t expecting anything other than your presence, but it can’t hurt to show up with a pretty ornament, a little sweet treat, or some furry slippers to warm their feet once they are able to sit and relax. During the holidays it can also be helpful to stock up on thoughtful little gifts as you never know when you may need to grab one at the last minute! 1.) Apron: Chances are they may already own an apron, but how adorable to add a festive one they’d want to show off to their guests! 2.) Candle: I love these candles from the new Hearth & Hand line at Target. Plus, you can’t beat the price. 4.) Salted Caramel Hot Chocolate: If I haven’t shared this in previous years, I’m sorry. This hot chocolate puts all others to shame. There’s no turning back once you start! If not for a gift, I’d highly recommend you stuff this one in your own stocking! 6.) Christmas Ornament: Adorable ornaments are always welcomed in our home. Plus, I love the memories that are always attached to them! 7.) Cutting Board: This piece not only serves as a cutting board, but can double as a serving tray. Win, win! 8.) Slipper: Who could resist these? Plus, they’re only $15! 9.) Peppermint Bark: This is more of a holiday staple. I love having it around for those unexpected guests that are bound to stop by. 10.) Wine Bag: Wine is an obvious go-to gift, but why not dress it up with a little wine bag? These come as a set of three so you can keep some extra on hand. 11.) Wine Glass Writers: Genius, right? Not only could they be used to help keep track of who’s glass is who’s, but for those artistically talented, you could decorate glasses depending on the event! 12.) Mug: A little token of appreciation that they can smile at as they enjoy their morning coffee. I have a few winter pieces that I’m not sure I’ll ever permanently remove from my closet. This shearling vest has been in there for a few years (not to worry, I’ve found more for you below) and each year I’m excited to break it out again. It’s so warm and pairs well with any number of tops. Here I threw it on over this pretty, textured top that I’m obsessed with. Obviously, it’s pink, but the textured detail and the gathered hem totally make it. Add a pair of flat, knee-high boots and you’ll be set! 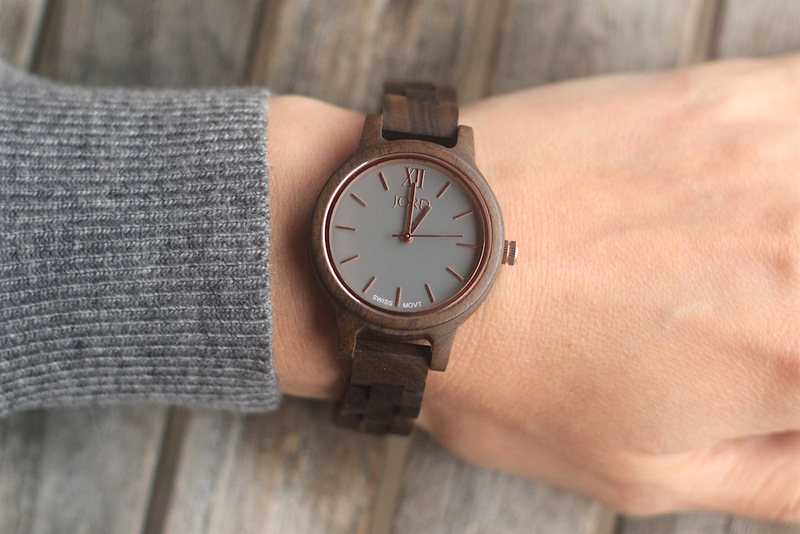 Click HERE for 25% off your choice of JORD wooden watches! So, it’s Friday. And there are less than two weeks until Thanksgiving and exactly two weeks until Black Friday. Am I the only one that’s just realizing this?! Oh and if you haven’t heard, the Rockefeller Christmas tree just headed out of (our) town yesterday! Audrey and I drove right past it as they were loading it up and we went on and on about it at dinner, but no one seemed quite as excited as we were :) We’re so happy to see a part of Happy Valley spreading some much needed joy. It’s also getting cold outside. I believe our high here is right around 30 degrees today. I’m kind of okay with that because all I hear is layers (hello turtleneck sweatshirt)! Bundling myself up is one thing, but then I’m reminded that the kids also need bundled. And kids do not enjoy being bundled (insert eye roll). I want to be that mom that lets them realize all on their own that it’s actually cold out. I’m just not sure they’d ever come to that conclusion!! And so, the struggle begins. It’s clear to me that we have entered November as the stores have immediately transformed into Winter Wonderland’s. In one sense I hate to rush everything along, but on the other hand, I do love the holiday season and I prefer to take the time to enjoy it all. The Christmas music (which I am on the verge of switching over to! ), the flavored lattes, the eggnog (that’s already in my fridge…what’s wrong with me?! 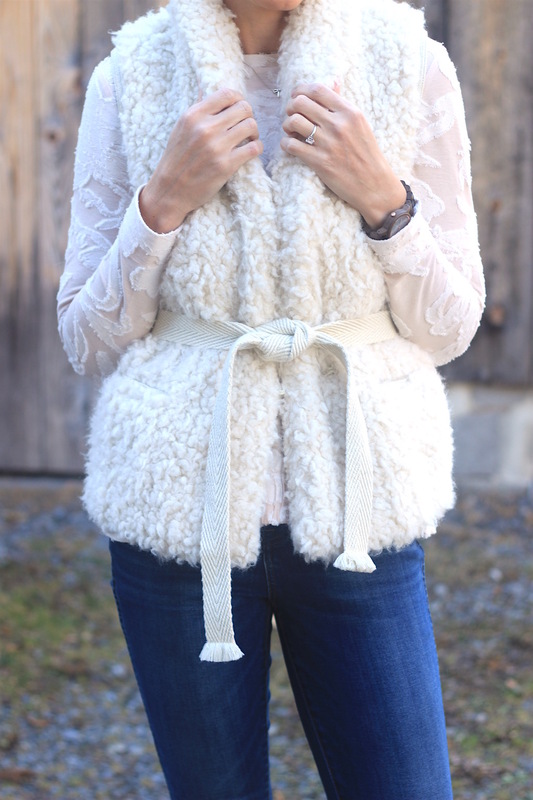 ), the holiday outfits (how adorable is this ruffled sweater? ), and yes, the gift giving as we celebrate Jesus’ birth. As I set out to do every year, I hope to track down those special gifts for everyone that I know they’ll truly appreciate. There’s nothing I despise more than running out the week before Christmas to buy something in order to fill a void. 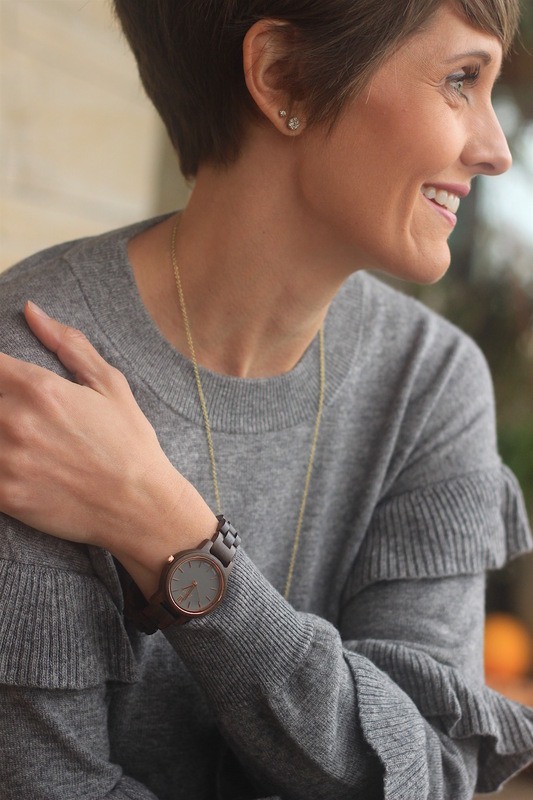 In an effort to help you start out on the right foot this season, I’ve teamed up with JORD Watches to introduce you to their stunning wooden watch collection. 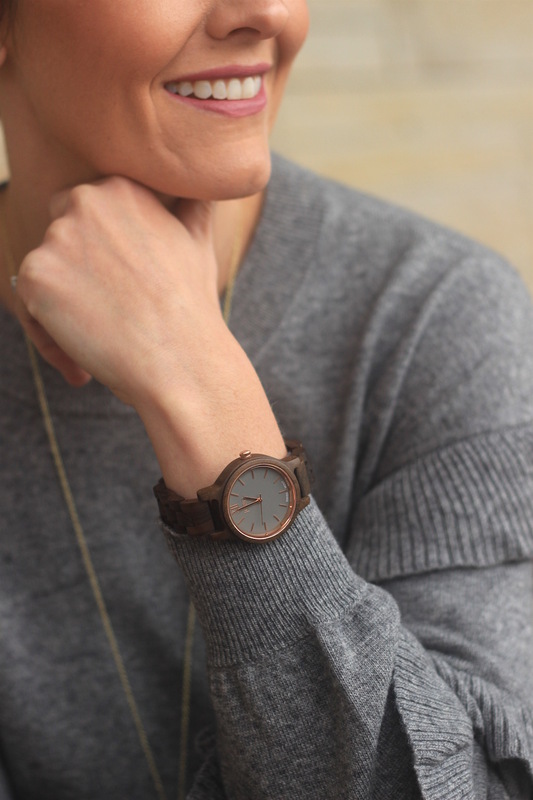 JORD offers a beautiful collection of both men’s and women’s hand-finished, wooden watches. I had the hardest time narrowing down my selection to just one as they are all so unique. My husband couldn’t stop commenting on it either, so I have a feeling we may be adding more to our household! There’s also an option to have yours engraved which would add that extra special touch to a gift (or to your own, because I’m not the only one that shops for myself during the holiday’s, am I?!). 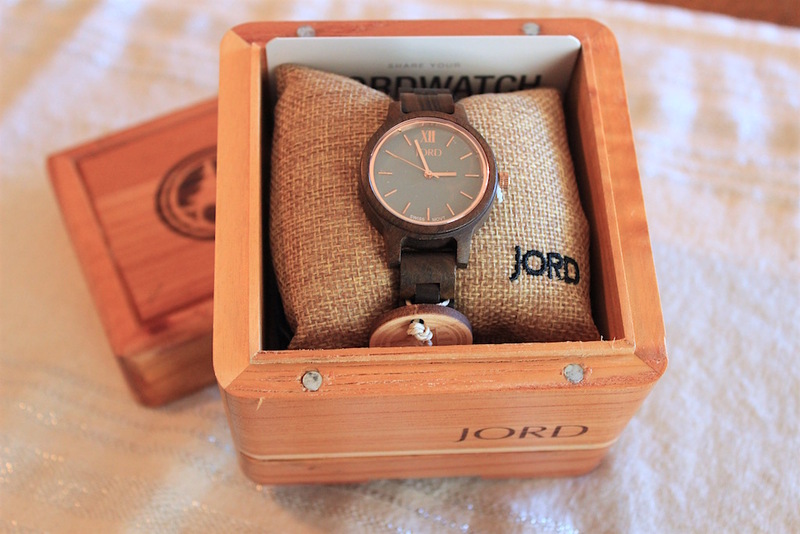 JORD watches are not only stunning and well made, but they are reasonably priced as well. What’s even better for you guys is that they are offering a 25% coupon code that you can redeem on any of their watches, yay!! Click here for yours, and let me know which one is your favorite! Click here to receive your JORD coupon code! Valid through Dec. 19th 2017.